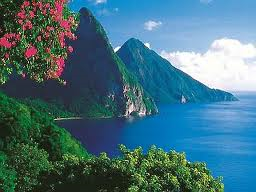 The small beautiful Caribbean island of St. Lucia attracts tourists all year round. Why do so many visitors choose St. Lucia as their one stop vacation destination? The logo ‘Simply Beautiful’ says it all. If you’re looking for a vacation in a beautiful, warm, tropical location then you’ve reached the right place. Not only does St. Lucia have the perfect weather; it is also a striking and romantic paradise beyond compare. St. Lucia isn’t only known for its amazing weather and stunning scenery though, there are also an array of attractions, activities and sightseeing tours on the exquisite island of St. Lucia. One place that is much talked about by tourists who have visited St. Lucia is the World Heritage Site of ‘The Twin Peaks’. The Twin Peaks of Gros Piton and Petit Piton are breathtaking to say the least. I don’t think words can describe the twin peaks; they are something which you’ll have to see in person. One thing that is guaranteed is that they will take your breath away. These mountainous twin peaks are located near the towns of Soufriere and Choiseul on the southwestern coast of St. Lucia. The twin peaks are also a very famous attraction for those with a love of the outdoors and are marked with the footsteps of hikers and mountain climbers. If you’re in St. Lucia and you haven’t yet seen these gorgeous green peaks, then your vacation hasn’t even begun. Please don’t resist climbing these gems; the view from above is remarkable. Another renowned attraction is the drive-thru volcano famously known as ‘The Sulphur Springs’. This volcano is an immense crater of bubbling muddy water that sprays hydrogen sulfide into the atmosphere. One thing you might not know is that this amazing crater is actually the world’s only drive-thru volcano. Don’t be afraid though, this Volcano is dormant and the last eruption occurred in the late 1700s and it was nothing major, just a minor steam eruption. The Sulphur Springs are located in Soufriere to the south of the Island. You can even take a warm and soothing mud bath in its bubbling sulphuric waters which are said to cure acne, rashes and other skin diseases. The Diamond Water Falls truly are amazing. These botanical gardens and waterfall are located at the foot of the pitons and it is the oldest botanical garden on the island. The gardens boast spectacular, exotic, rare tropical flowers and the trails are well groomed with the perfumed scent of flora. You can also enjoy a mineral rich bath in the water that falls from the Volcano. The baths complex mineral makeup is what makes it so unique. These minerals flow straight from the volcano and rain forest and not only are they health imparting but they also give the falls a vibrant appearance like diamonds in the mist. If you want to experience St. Lucia’s history then there are also some historical sites that are very interesting to see, for example the Forts. St. Lucia is said to be ‘seven times British, seven times French’ because the French and English battled over St. Lucia’s possession seven times. The initial battle between the French and the British over the possession of St. Lucia took place at Morne Fortune where ‘Fort Charlotte’ still remains. Visitors can walk through these forts and experience what it was like when the battles first took place. There is another large fort at Pigeon Island, in the north of St. Lucia where you can explore the canons, dungeons, barracks and cells and let your imagination run wild. The view of the beach at Pigeon Island will make you want to stay forever. 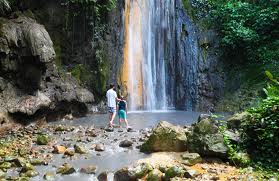 St. Lucia also offers a wide range of dark green luscious rainforest. This rainforest plays home to unique animals, rare birds and plants especially the National Bird, the ‘Amazona Versicolor’ or the Jacquot. You can walk through these rain forests and experience nature like you’ve never seen it before. Rainforest sky rides are also available and the tour guides are super friendly. The Emerald Isle of ‘St. Lucia’ is one of most romantic destinations in the Caribbean. Honeymooners are destined to return and families can’t get enough. Whether you want a vacation with a loved one or an exciting holiday for your family, there are a large number of all-inclusive hotels to choose from in any part of the island. Hotels* such as Sandals, Jade Mountains, Coconut Bay, Almond Morgan Bay, Jalousie Plantation, are just a few of the hotels on this wonderful island. These hotels are budget friendly and offer Sandy beaches, snorkeling, sightseeing, fun activities, natural dining options and more. Could you handle living in the middle of nowhere? Wow that looks really amazing! A little bit like the Canary Island for the volcanic part, but surely with warmer climate, and more pristine. It really is beautiful Pauline, another addition to your extensive travel list! Wow, it looks beautiful. You don’t need to convince me! I just need to fund such a vacation 🙂 Luckily the weather has been getting better, making a tropical vacation less necessary. Glad the weather’s better where you are Tushar, it’s not so great in the UK! I’ll be sure to Google the Emerald Cove, it really is stunning isn’t it. We went to St. Lucia on our last cruise and very quickly discovered that one day there was not enough and that we want to go back and stay just there. It is stunningly beautiful and the Pitons are amazing. I hope you’re able to go back John.